Mac Guide: How to ping from Mac computer? Running the cmd in Windows would ping the internet, web address or the IP address. But in Mac, the things are hard to find for a new user. 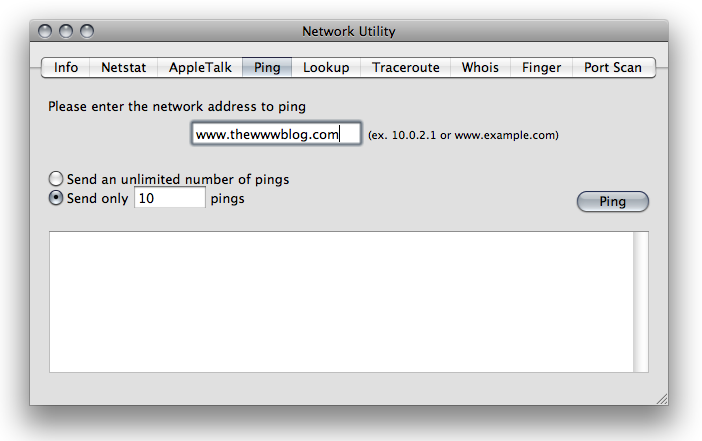 And its one of those utilities which you have to open, to play with the pinging process in mac. You will see one result in the Applications section, which is the Network Utility App. Select that and then you would see the Utility with loads of sections and options. Go to the Ping section. There you can see the box where you can ping any web address or IP address to ping their domain servers. You can also set it for any limited number of pings or unlimited number of pings. And while the pinging process is going on, you can stop the process anytime in middle. That’s not so hard, but not so directly findable feature in mac. I really must get me a Mac and see what they are like. I have been using Windows ever since i got my first pc years ago. Just a quick note, ping works just fine from Terminal – the Mac version of ‘cmd’. Network Utility is just a friendlier/graphical front end.